Oulun kiipeilyseura has its own ice climbing tower a few kilometers from Oulu (map). The tower is for use of the members and there are free training hours once a week. It offers 20 meters of vertical climbing with ice picks, ice shoes and crampons. The tower is for top rope climbing, so you don’t have to be a lead climber to be able to climb at the tower. Therefore, it is good also for beginners! There is a warm hut where you can rest after ascends. There are no toilets at the tower. Join the tower service group, which allows you to climb there any time, as much as you wish, plus take on member with you to climb. Purchase a season pass for 100€ + membership (=45€ or 85€), which you don’t necessarily have to activate. It is important to follow the rules at the tower, and every new “tower climber” has to visit the tower at least once (e.g., the Sunday training hours or with someone from the tower service group) to see how the tower works. However, do not be afraid of the tower, it is not rocket science and it’s meant for everyone! To pay the single ticket, rental equipment, or the season pass, use account number FI62 8900 8710 6619 57 and reference number 1342. If you wish to become an OKS-91 member, fill the membership application and pay the membership fee separately. If you purchase a season pass, please inform jaatorni ät oulunkiipeilyseura.fi. At the moment, all fees must be paid beforehand, so bring a receipt with you! Free training hours for members on season 2015-2016 are on every Sunday at 11am – 5pm. If you need climbing equipment, the price is 5€ per single visit. Also non-members can use the tower at the training hours, for them the single ticket costs 15€ plus the optional equipment rental (same 5€). To pay the single ticket, rental equipment, or the season pass, use account number FI62 8900 8710 6619 57 and reference number 1342. At the moment, all fees must be paid beforehand, so bring a receipt with you! If you wish to climb at the tower at other times, it is also possible for 15€ per single visit. There is a logbook at the tower, all climbers have to sign their name to the logbook every time they visit the tower! 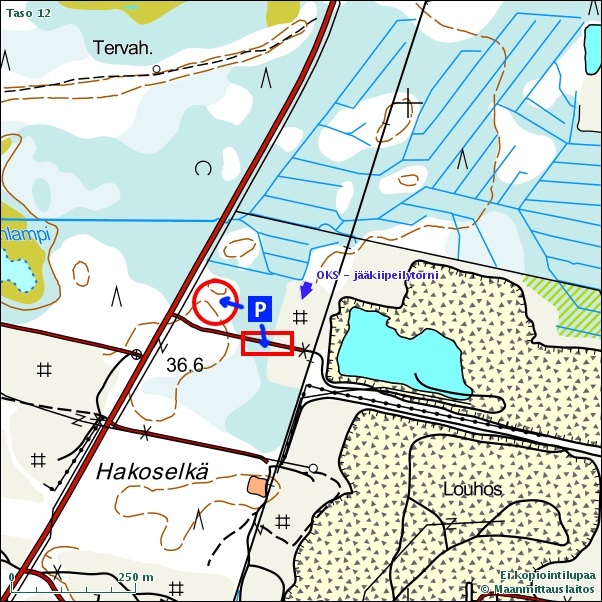 If you need rental equipment for the training hours or otherwise, agree with the person responsible for the equipment rentals about the delivery and return times and places (Matti Ventä, 050-3717358, varusteet ät oulunkiipeilyseura.fi). Usually the equipment rentals for the Sunday training hours are done so that the equipment are collectively delivered half an hour before the training hours start (i.e., 10:30am), and the return time is at the OKK training hours (Tuesdays, 20-22). The tower is run by an active service group. The contact for the service group is Veli-Matti Laasonen (040-8653652, jaatorni ät oulunkiipeilyseura.fi). He can give you all the information you need about the tower and the service group. We are always looking for new people to join the service group. The service group members can climb at the tower as they wish, and their duties are the upkeep of the tower, which means preparing the tower for freezing at the Autumn, and during the Winter, making sure that the freezing equipment functions properly all the time. IMPORTANT: Follow the rules at the tower, do not cause any interference to the property owner! EVEN MORE IMPORTANT: Never shut down the water pump at the tower. If you do not know what the switches do, do not touch them. Instead, ask help from someone first. 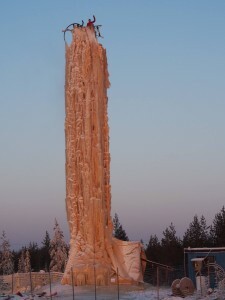 The ice tower is located inside a quarry. Cars should be left outside of the gate so that they do not cause any interference to the heavy duty traffic passing by. See the map below for possible parking places.